The lights may shine brightly in Hollywood, but, if you're talking about Hollywood, South Carolina, the lights in question are most likely in the sky. Clear starry nights and salt-tinged breezes are par for the course there, and that's the way the locals like it. 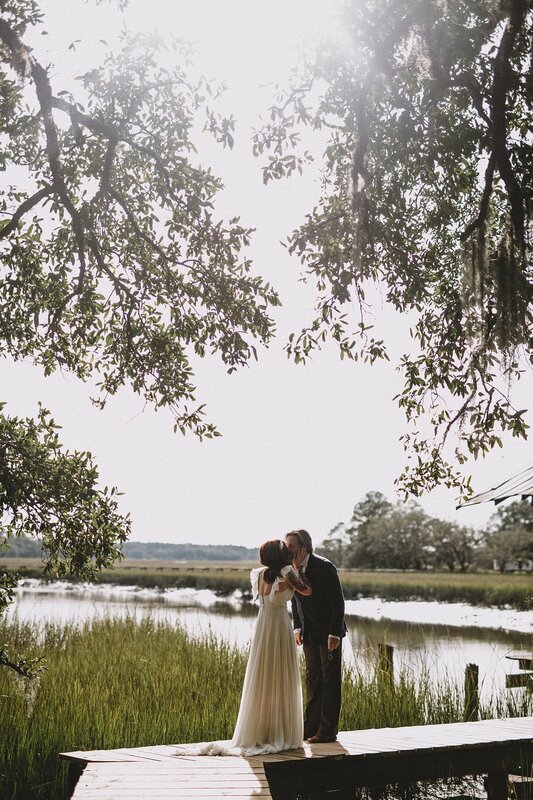 This beautifully rural area just south of Charleston is where Nick Tecosky spent much of his childhood, and it's where he and bride Amy Stufflebeam knew that they had to get married. When we asked Amy why they selected the location, she answered, "I mean, have you seen the photos? Foster's Pointe is straight out of a fairytale: a hundred year old live oaks, Spanish Moss, a bubbling tidal creek. You don't get much better than that." And her response is so true. 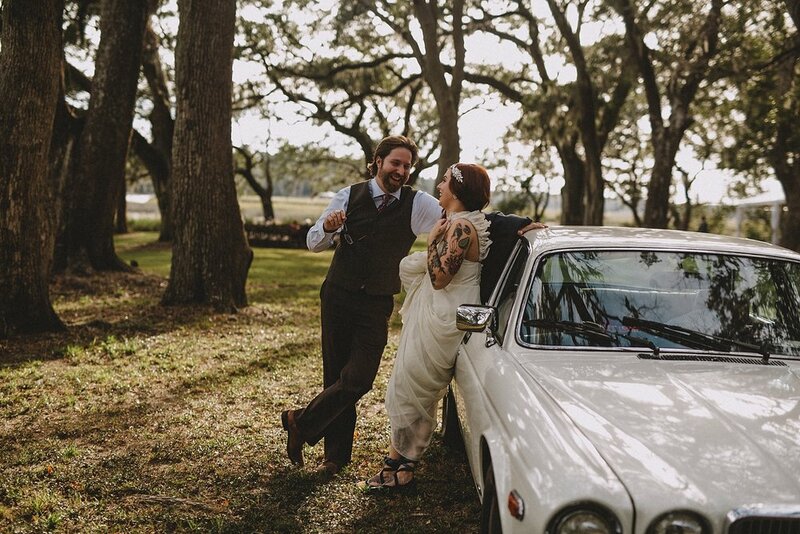 Come get swept away in the modern-yet-vintage literary wedding that this couple put together and that photographer Josh Rigsby so perfectly captured. "We were sprouted in the grey-black pluff mud of the Lowcountry, my siblings and cousins and I, and we spent our summers swimming in the warm brackish water of the River that flowed past our dock at Foster's Pointe. Foster's Pointe was magic. To children, the smallish plot of land outside Hollywood, South Carolina, was a vast wilderness, where we caught fiddler crabs by the water, climbed the branches of the great live oaks, played hide-and-seek in the dense grove of camellias my great-grandfather had planted decades before. I am what I am because of the water and the land, and the family that raised me. There is a test for newcomers to Foster's Pointe, whether friend or lover. The test was handed down from the Aunts, whom we love and fear and whose word is final, Amen. The test is very simple: they must love Foster's Pointe at first sight, or they are not worth keeping. I didn't have any worries about Amy passing the test. Amy knows a good thing when she sees it. And so when she first breathed in the salty-sulphur air of the marsh at low tide, she fell hopelessly in love. In the following years, we'd escape out into our wilderness whenever we could, and we grew together in the Lowcountry. When she asked to me to marry (Amy also knows when she has to take the initiative), there was only one place that either of us could see gathering our loved ones together to celebrate. There was no question. 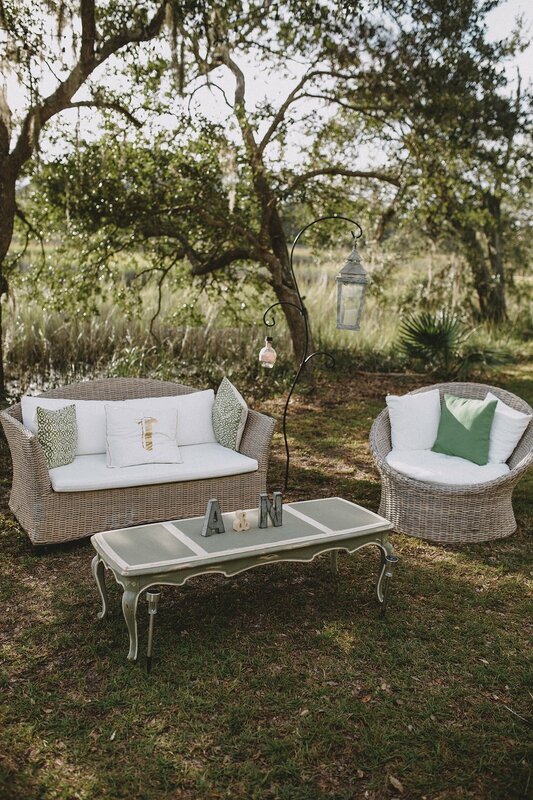 With family and friends surrounding us under the live oaks, we were home." Even in a place as large as Atlanta, you're bound to run into the same people from time to time, especially when you're working in the same field. Amy and Nick, who are both writers, met over and over again at various live lit events throughout Atlanta until they decided that maybe they should stop bumping into one another on accident and made plans to be together on purpose. Though the couple calls Atlanta home, they frequently made trips to Charleston together to experience the best of the Holy City and its surroundings. 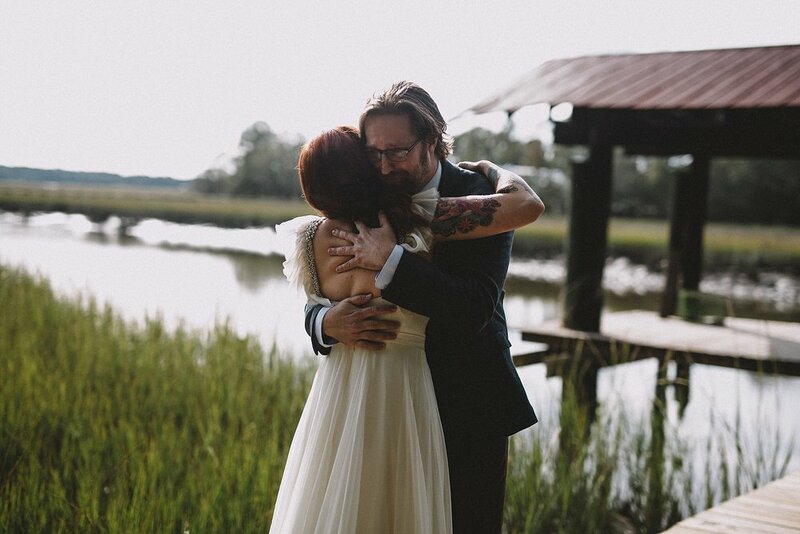 On one such trip, Amy had a special surprise for Nick as they walked along the Charleston harbor waterfront. "I read him a letter (which he thought at first might be a break-up letter!) and then got down on one knee with a ring and said "So whaddaya think? Wanna marry me?" That was that," she recalls. I met Nick + Amy through a free wedding giveaway that I was doing. After reading their story, I knew that we would be a perfect fit. We hit it off from day one. As soon as Nick accepted Amy's proposal, the two dove into the process of planning their wedding celebration. 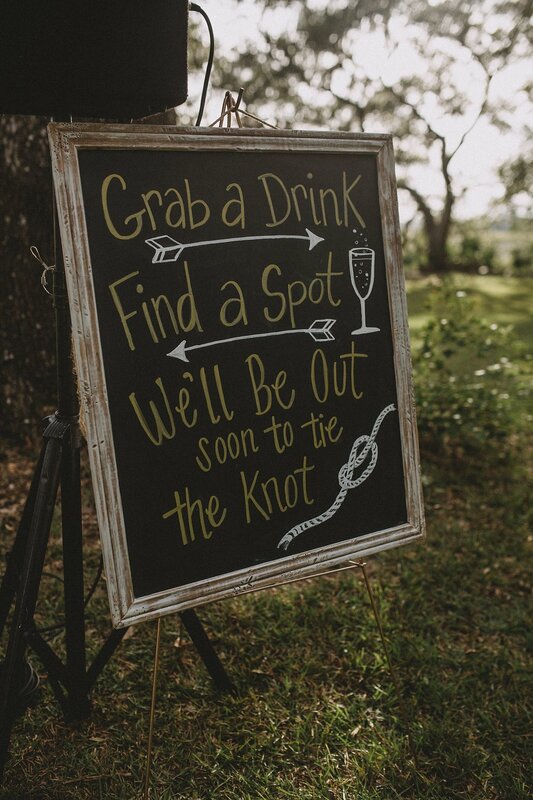 In addition to the usual decisions on bridesmaids' dresses and tie colors, Amy and Nick also had to turn the rural Foster's Pointe into an event space. This was no small task considering that the property was designed to be a relaxing private residence in stead of being a space to have a nobody's-ever-going-to-forget-this bash with dozens of invitees. 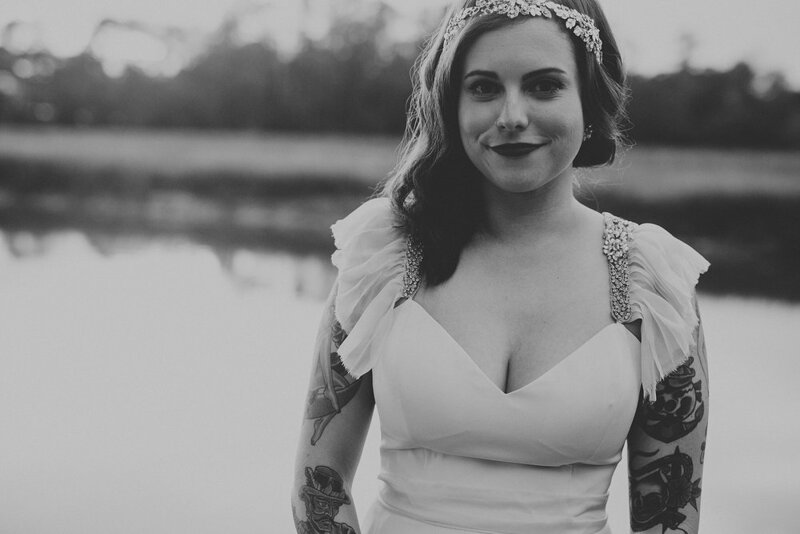 "Having the wedding at Foster's Pointe meant bringing in infrastructure--bathrooms, food trucks, lighting, and more, so we had to work around those things," remembers Amy. The effort of molding the space to their needs was worth it in the end. Says, the bride, "Honestly, I think it turned out perfectly. The most important thing for us was to eat good food, dance and drink delicious booze with our favorite people, and we accomplished that and then some." On the day of their nuptials, Amy and Nick chose to start their celebrations with a first look. What might have started as a practical way to get the portraits out of the way before the festivities got underway turned into an emotional experience for both the bride and groom. "Having a cocktail and taking photos with Josh was the quietest, most intimate part of the experience. 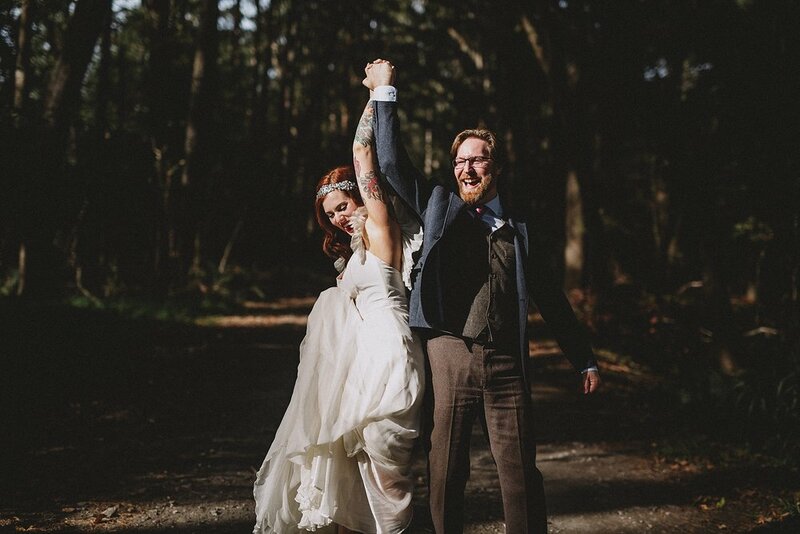 We really loved walking around the property, soaking up the afternoon before all the (wonderful) chaos ensued," recalls Amy of the time spent with photographer Josh Rigsby. Another top moment from the night included sharing a drink from a silver cup that was an heirloom piece from the groom's family. in fact, Amy and Nick were the fourth generation of the family to include the cup in their wedding celebrations! The couple had a phenomenal time at their reception, especially when they "gathered in a circle to sing Billy Joel's "Piano Man" at the reception. 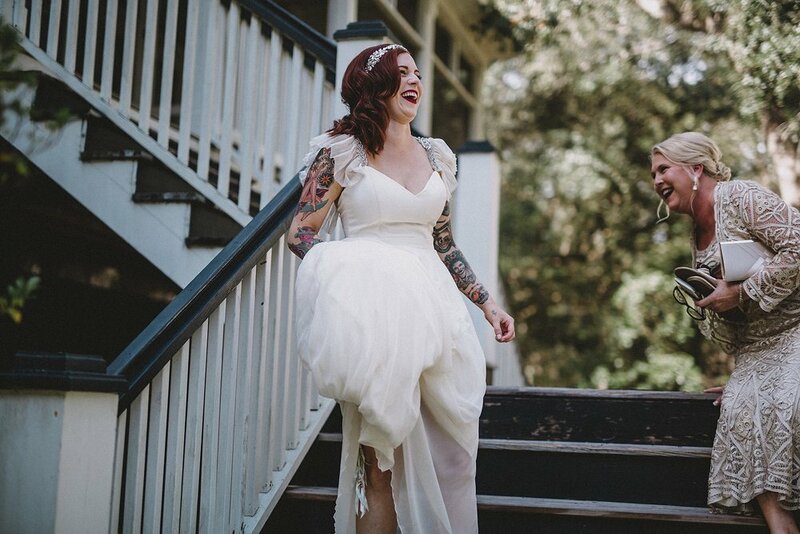 The latter is a strange tradition, but I'd say it definitely competes for my top wedding moment!" says Amy. As if their fun-loving, perfectly eclectic and seriously romantic outdoor wedding wasn't awe-inspiring enough, the sky had something to add to their decorations as well. "There was a meteor shower that weekend, so we were able to see shooting starts beginning on Friday night. It was truly magical!" We'll take those lights over the ones in the other Hollywood any day.